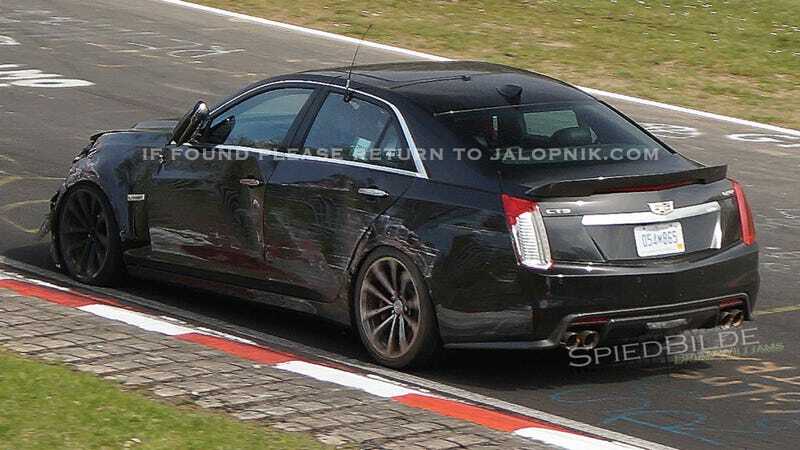 We’re still trying to figure out exactly what went wrong, but this is what it looks like when a 2016 Cadillac CTS-V prototype bins it at the Nurburgring. The 640-horse supercharged V8 beast cannot be tamed, apparently not even by GM’s expert test drivers. As super-spy photographer and Friend of Jalopnik Brian Williams notes, it looks like the car hit the side of the track and got its left side crumpled up, breaking everything from the headlamp to the taillight. The front left corner of the car is all smashed in, pointing to a potentially rough hit. It wasn’t rough enough, however, to prevent the car from making it around the track and back to pit lane. Or to have the airbags deploy, though they might’ve been disabled for track testing. If you have any doubts that it’ll be, at the very least, INTERESTING to drive, dismiss them all now. Just spoke to the team, as yes we are testing in Germany now.The good news is the situation you asked about was thankfully minor - the driver is fine, no issues. In fact I’m told the car involved only had a brief respite, no immediate repairs even, and rejoined the testing. I think a few bruises to bodywork was the full extent. More or less normal. And not unusual in such a long and intricate circuit, in a very thorough series of tests, that you’d have some sort of imperfection.We have a very experienced team with proven and precise methods. If we hear anything more from anyone at the track, we’ll let you know.